“Conto alla rovescia” is an often-recurring Italian expression. It simply means “count-down” and it’s definitely count-down time for the Bagni di Lucca Arts Festival which officially opens on July 4th at 6.30 pm with a grand and entertaining evening of jugglers, circus and music for everyone. Yesterday we were in Lucca’s sumptuous ducal palace in Piazza Napoleone to attend the Arts Festival press release conference. 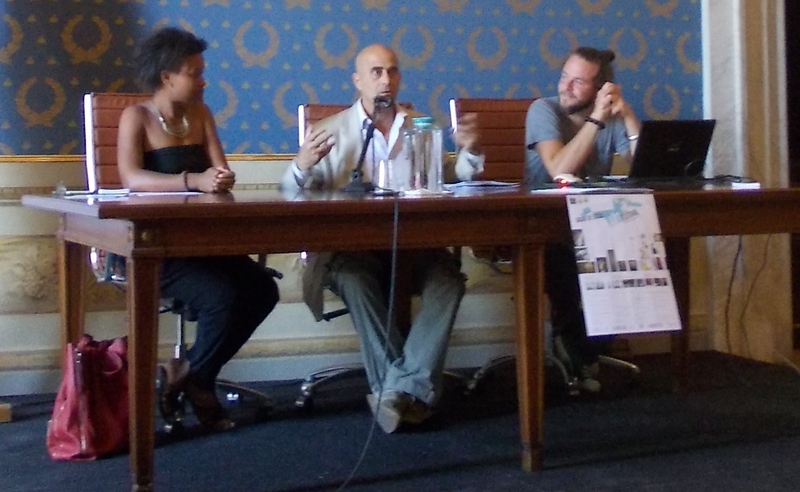 Introducing was the festival’s seminal figure, Jaqueline Varela, with her fluent and persuasive style, in the centre of the table was Mayor Massimo Betti of Bagni di Lucca and to his left was Jake, Jaqueline’s other half. The progress this Bagni-di-Lucca shaking event has made since its incredibly successful debut last year could be seen in the choice of location and the presence of our commune’s first citizen. Few places can match the opulence of the magnificent state rooms of Lucca’s biggest palace and it is significant that the festival now has strengthened the official imprimatur of the commune’s administration. 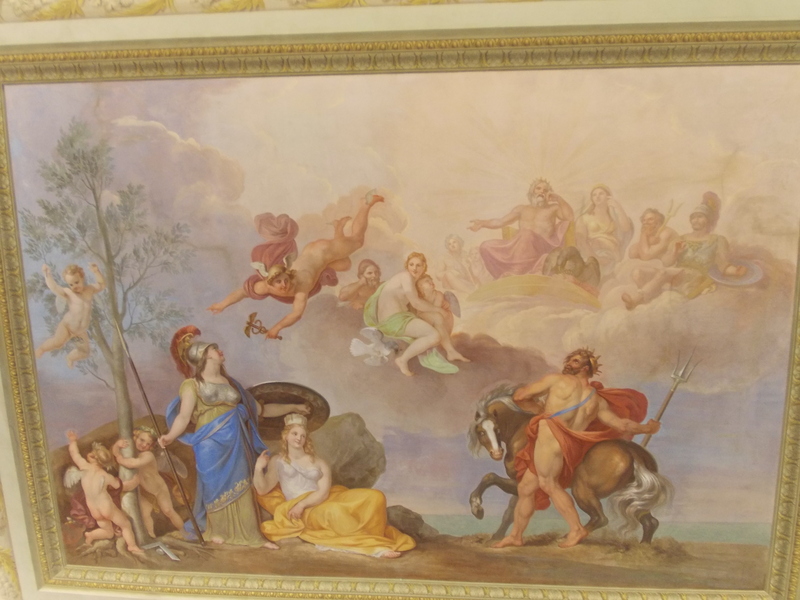 Incidentally, the superlative frescoes in the ducal palace are not there to glorify the reign of Elisa Baciocchi, Napoleon’s sister, over Lucca. Quite the opposite: Luigi Ademollo painted them in 1820 by command of her successor, Maria Luisa di Borbona to affirm the virtues of the restoration and condemn the vices of the former empire. Such is the power of art! 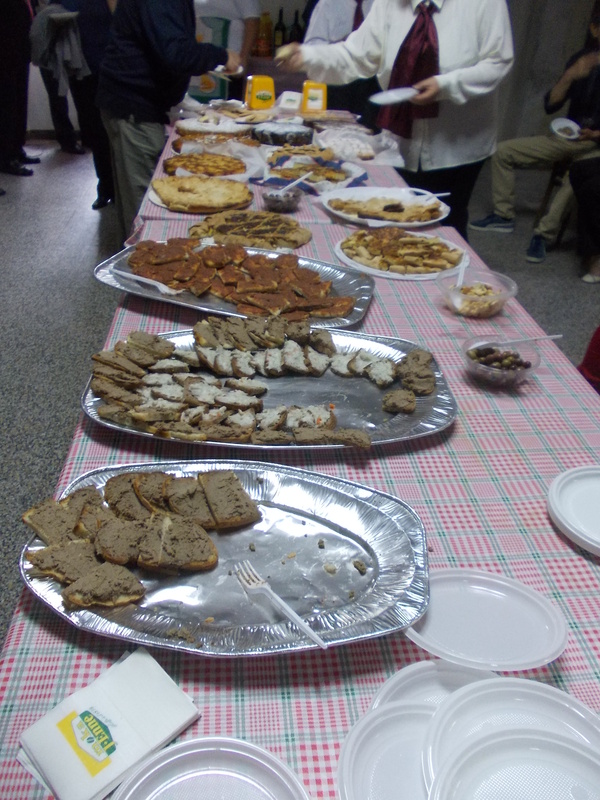 Among the audience were representatives of all the major Italian and English language newspapers and magazines of the province and region. Questions were asked and were all satisfactorily answered. Would there be any differences in year two of the Arts festival as distinct from year one? The winning formula would be pursued of course – a balance between formal and flexible organisation. There would, however, be an effort to involve Bagni di Lucca Villa more in the event. After all, Villa does have more than its share of empty shops – I am particularly thinking of that delightful venue which used to be at the Piazzetta and, of course, the precarious future of the circolo dei forestieri. Further venues at Ponte would be opened, including the Casino, and greater emphasis would be paid to involving all sectors of the public at all degrees of artistic interest or involvement by introducing more art and sculpture courses. We know now that after the “strepitoso” success” of last year’s “first edition”, the Bagni di Lucca Arts Festival can only grow from strength to strength. The energy is vibrant, the enthusiasm is strong and the creativity is flowering. Concentrating on the primal instinct of artistry which lies in every sentient being we can now build the festival into something which will continue to form a major part of Bagni di Lucca’s identity and its already very attractive calendar of events. We decided to visit Kew palace. 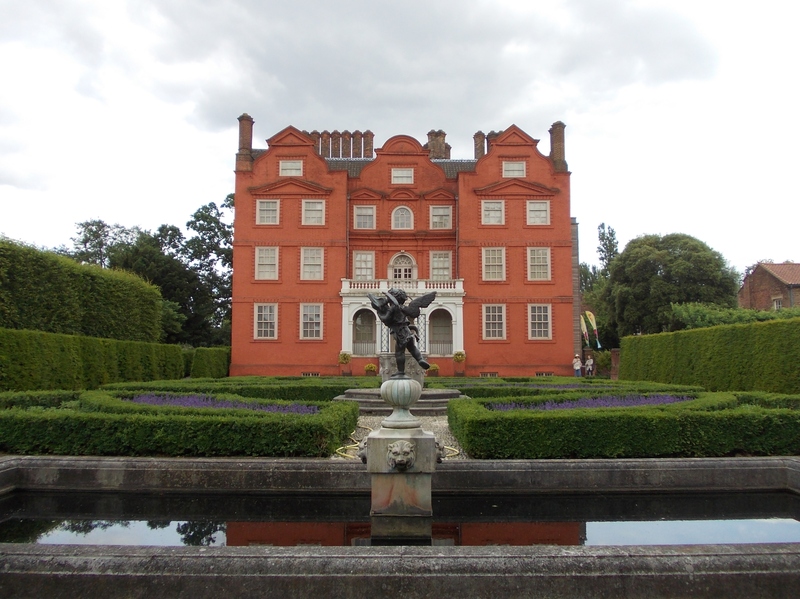 Whether one wants to visit the Royal botanical Gardens (world heritage site since 2003) or not, one has to enter it to arrive at Kew palace. But who wouldn’t want to see these fabulous gardens at any time? 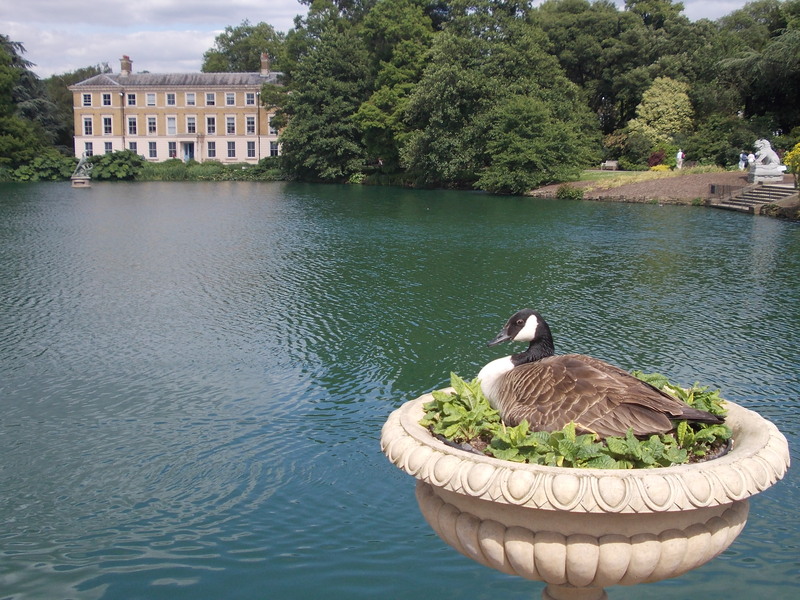 A visit to the Royal Botanical gardens at Kew and its Palace is a delightful way to spend a sunny afternoon in London. (And London has been particularly sunny while I was there). As life members of the Arts fund we were able to enter them at half price (and Kew palace for free), which is a considerable saving since the standard admission charge is £15 – a far cry when to get past the turnstiles one placed just one penny in the slot – not centuries ago but as recently as 1971 (if I remember correctly). This means that the admission price has increased at least 30,000 times! Having said this, a visit to Kew was worth every penny, inflated, decimal or not! Kew has not only the largest collection of plants in the world; it has the best example of Victorian iron and glass building in Decimus Burton’s palm house, the best example of chinoiserie in Sir William Chambers’ (he of Somerset house) pagoda, indeed the best of so many things. From the Victoria entrance we headed for the palace which was actually used not so much as a “palace” (it’s only the size of a large house) but as a nursery for King George III’s children (of which he had fifteen who survived sired off Queen Charlotte who died here in 1818). On our way we spotted a goose that had chosen a slightly exposed nesting place. Perhaps she enjoyed classical architecture! 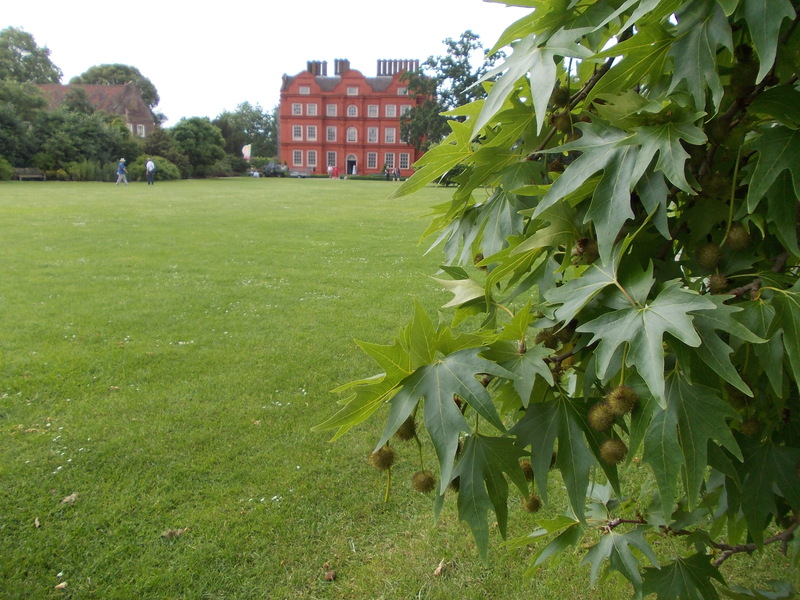 Kew palace must be one of the smallest of royal palaces and was George III’s favorite residence. For me the highlight was its herb garden which was beautifully laid out and provided some of the remedies which the king’s physicians tried on his madness, (remember the film starring the incomparable Nigel Hawthorne? ), which has now been diagnosed in retrospect as bi-polar syndrome. Nearby were the kitchens with a delightful vegetable garden outside which also grew artichokes. 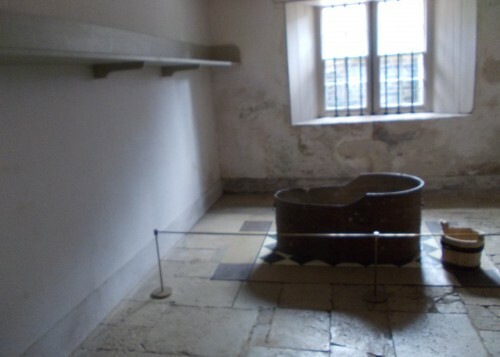 The King’s bathroom would definitely be in need of an upgrade should any royal visitors take up residence here again. 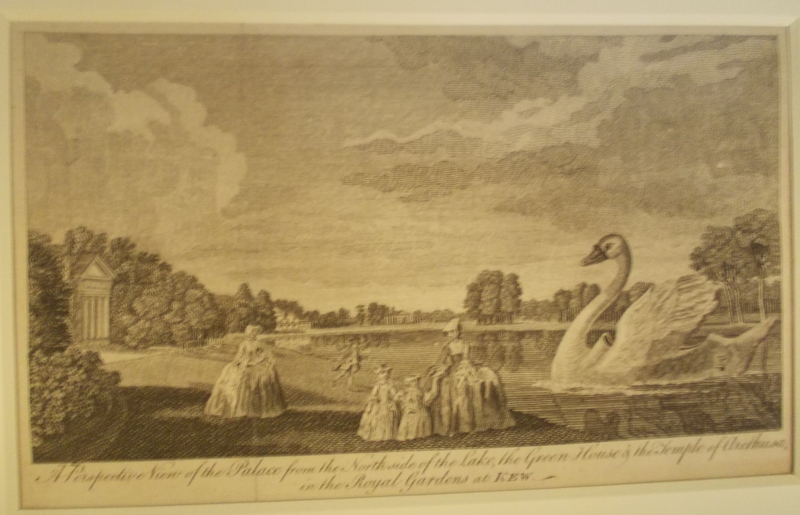 Kew palace was once also the scene of fetes champetres including this one which featured a giant swan..
We found the palace very well-displayed but the only thing I wished for was that the brick work should have been stripped of its red paint to more clearly expose its unusual (for the UK) Flemish bond which has also given the building the alternative name of the Dutch house. Back in Kew Gardens we explored the tree walk which was only opened in 2010. It was definitely not for vertigo sufferers since there was also a slight sway on it but what a great way to climb trees without the effort or the possibility of breaking one’s neck! My visits to Lucca’s botanical gardens, still continuing to be very delightful, will never be the quite the same again although, at least, I’ll be more able to afford its entrance fee of three euros! In the evening at the Punch tavern in Fleet Street we enjoyed a Beckenham historical society supper together with the company of an old school mate. Let us say that the company was rather better than the food…although the beer made up for that. 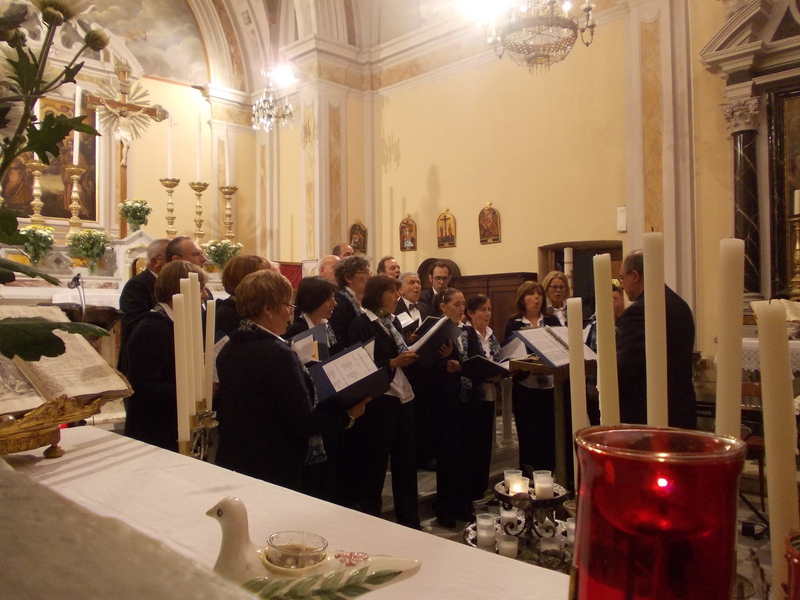 to the peaceful atmosphere of the Sanctuary of Migliano in the comune of Fosciandora, where I joined my choir of San Pietro e Paolo di Ghivizzano to celebrate the month of May, which is also the month of the Virgin Mary. It will hopefully be just the same for next year as our choir has contributed to the Marian festivities here for some years now. and that after the Mass refreshments took place indoors and were largely confined to the choir and co-workers. It was my second big tuck-in in one day. How can one resist such delicious spreads without spreading out a little oneself! I noticed that work was well under way to convert the old friary into a centre for the charity’s beneficiaries. I also took some more pictures of this delightful place, in particular of its fabulous carved wooden doors which also include a panel describing the famous Volto Santo in Lucca cathedral. Sorry, no pictures of the choir this time. I must get them to pose after the Mass next year when we sing at the sanctuary again! It was great to be there and realise that this too had once been a war zone when the allied forces advanced to this point in the last months of 1944. How could such peaceful places have once been theatres of war – I thought of my wonderful trip, long ago, to that massacred, tortured country which is Syria today. which is quite a tall order but, as I have stated before, there are plenty of job vacancies if one wants to apply as a parish priest in contemporary Italy! This year Don Emiliano commemorates twenty-five years of priesthood and presented me with this imaginetta. He has also had to overcome a serious tumour and I was very glad to see him in such good shape for a very special event last night in Bolognana’s church, dedicated to St Margaret. I felt all the seven choirs at the Rassegna passed my one-star rating, which stands for “competent”, and most of them even reached two-star rating which stands for “good”. 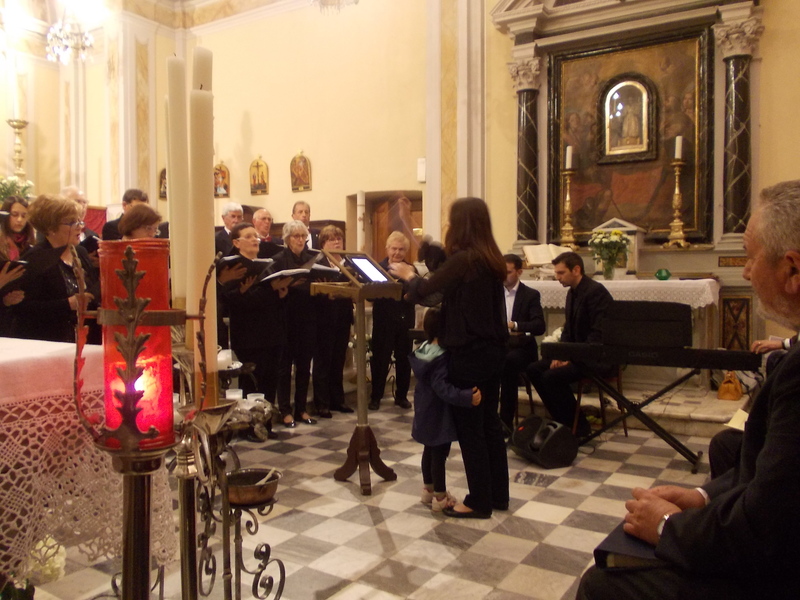 These choirs included Bolognana’s own Schola Cantorum Don Carmine, conducted by Maria Monica Vick, whose recital included a Kyrie and Gloria from a composer I’d never heard of, Mons Egidio Corbetta from the Bergamo region who only died in 2009. I loved the way Lia’s little one came towards her to hug her and give her full support for the whole time she conducted the excellent choir – truly growing up in a musical environment! Lia’s little daughter will, no doubt, be as good a musician as her mum. The Corale Del Duomo di Barga followed directed by Roberta Popolani. I felt this choir could have had more impact and more members as it does come from a cathedral. However, all its pieces, dedicated to the Virgin in this Marian month, were sung with true devotion. Don Fiorenzo Toti (an international authority on polyphonic music) and his choir stunningly raised the evening’s standard, concluding their recital with a wonderful rendition of Spanish renaissance composer Tomas Luis De Victoria’s O Magnum Mysterium. The choir’s intonation, voice balance, timing, and sheer musicality were a total pleasure. I have no hesitation in declaring it one of the best in the whole Serchio valley (if not in Lucca province) and worth travelling miles to hear. 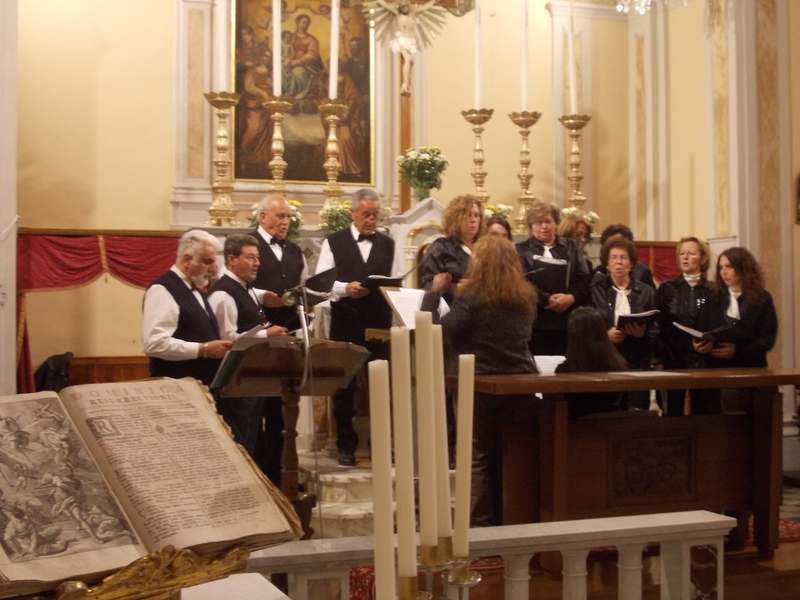 At this point our choir had to file out to get ready for our bit and so I have no photos of the following choir from the Pieve di Loppia e Tiglio and, of course our own Coro SS Pietro e Paolo di Ghivizzano. Loppia’s choice of pieces from Mendelssohn and Haydn were ambitious but the choir sailed through the music’s difficulties with conviction. As far as our own happy band was concerned, judging from the strong and heartfelt applause, our first appearance at this festival went down very well and conductor Andrea appeared rather pleased with our effort. There is something quite remarkable about the music life in the province of Lucca. 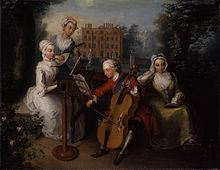 With a population of just 372,244 it manages to create so many choirs of good standard and certain choirs of outstanding quality, in addition to its soloists, orchestras, chamber music groups to say nothing of its gospel singers, and practitioners of other genres of music including folk, jazz and rock. In contrast (sadly, I have to say) the borough where I used to live, the (now) Royal Borough of Greenwich has only a slightly smaller population of 254,557 and just one choir of international repute although, undoubtedly, with the Trinity school of music now installed in Sir Christopher Wren’s fine buildings, it is receiving an injection of new musical life. 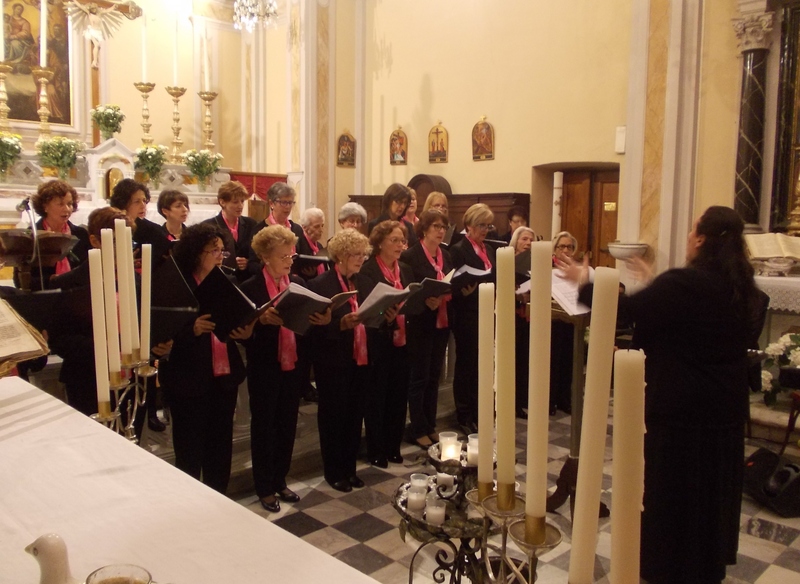 There is, clearly something about mountain-based communities that generates good choirs (rather like those famous Welsh Valleys) and there is also something about the nature of Lucca’s great musical past that continues to feed into the new generations and invigorates musical life here to a remarkable degree. With the multiplicity of churches within Lucca’s tree-crowned walls, Sant’Agostino, in the north-west part of the inner city, doesn’t seem to get that many visitors. Its exterior in unprepossessing and its interior doesn’t seem to warrant a detailed inspection. Yet this church holds one of Lucca’s greatest mysteries and two further minor mysteries as well. 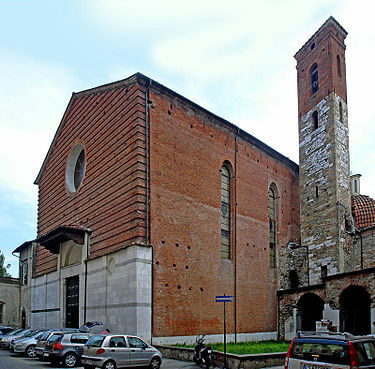 St Agostino was completely rebuilt in the fourteenth century on the site of the monastery of Augustinian monks and the church of San Salvatore-within-the wall, so called because part of the old Roman theatre was used for one of its sides. To this day, the bell tower of the “new” church is set on the arches of Lucca’s old Roman theatre – not to be confused with the famous amphitheatre in the north-east part of the city. That is mystery number one – did you know that Lucca has remains of a Roman theatre as well as of an amphitheatre? Dating back to the second century, other parts of Lucca’s Roman theatre can be spotted in Via S. Giorgio, Via S. Sebastiano and Piazzetta delle Grazie, where the curving outline of the houses shows that they have been built directly on the theatre’s foundations. Sant’Agostino is built largely of brick with a few decorations of white limestone pilasters. Its interior was remodelled in 1664 with a single nave and three chapels in the apse. 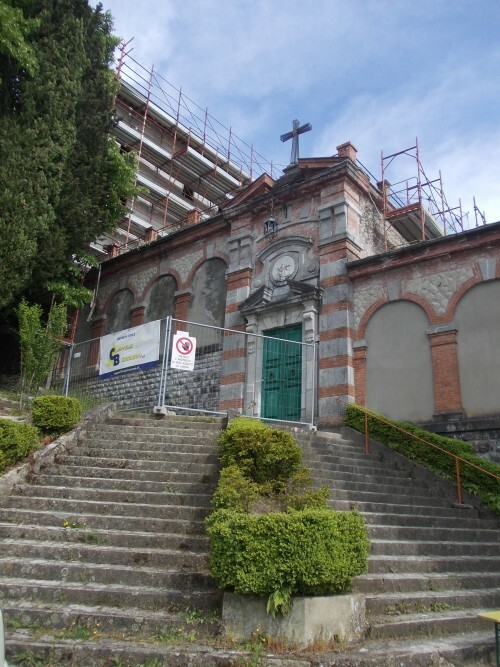 One of these chapels contains the venerated image of the Madonna Del Sasso (Madonna of the Stone) which leads to the church’s second and greatest mystery. The Madonna Del Sasso is so-called because a local man, who had just lost a large amount of money in a betting game after he had asked for the Madonna’s help in winning, took it out on her by throwing a stone at her image in the church, upon which the image began to bleed, and a chasm opened up below the vandal (and blasphemer), swallowing him into the jaws of hell. For many years the chasm was left open and it was stated that if one dropped a dog in it and lifted the poor beast up again the animal would have a singed coat and smell of sulphur. It was, in fact, believed that this chasm was one of the entrances to hell, rather like the Phlegraean fields near Pozzuoli in Southern Italy. Some merciful people considered diverting floodwaters from the Serchio River into the chasm in order to alleviate the suffering of the burning souls considered to lie at the bottom of it. At the end of the eighteenth century the chasm was covered over by a trap door which can still be seen today. I found it impossible to lift the trapdoor and verify the story, which is just as well as I may not have been here today to relate the fact! The third mystery of Sant’Agostino relates to a remarkable nun, the Blessed Elena Guerra (1835-1914) who crusaded against the newly united Italian nation’s violently anti-clerical stance and against the increasingly diffused spiritualist movement with its séances and communications with the dearly departed. Elena founded the congregation of the Oblate Nuns of the Holy Spirit believing that the Holy Spirit would fight against the Spiritualists (who had their British headquarters until recently in 33 Belgrave Square, London and whose most significant members included Sir Arthur Conan Doyle, creator of Sherlock Holmes, among other memorable characters). Elena Guerra had an appropriate surname, translated as “war”, since she was a character of very strong views and was eventually thrown out of the order she had created because of major differences. In 1959 she was beatified by Pope John 23rd, who only recently has been promoted from beatification to full saint-hood. Indeed, there are many nuns associated with Elena’s Order who are asking for her canonization. 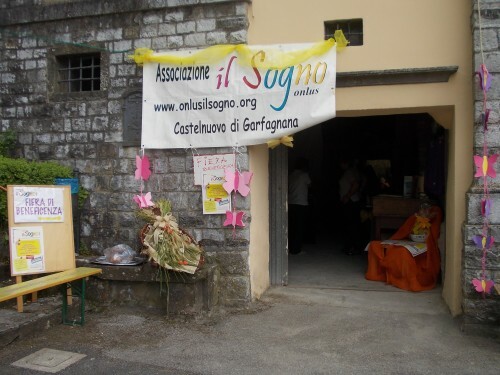 One of them I met in Sant’Agostino and told me many more stories about her foundress. 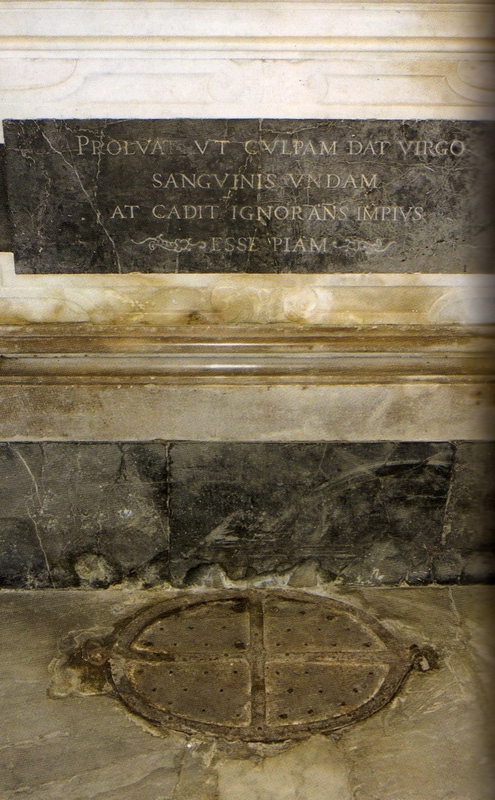 Elena Guerra’s body lies entombed within the church of Sant’Agostino for all devotees to admire. 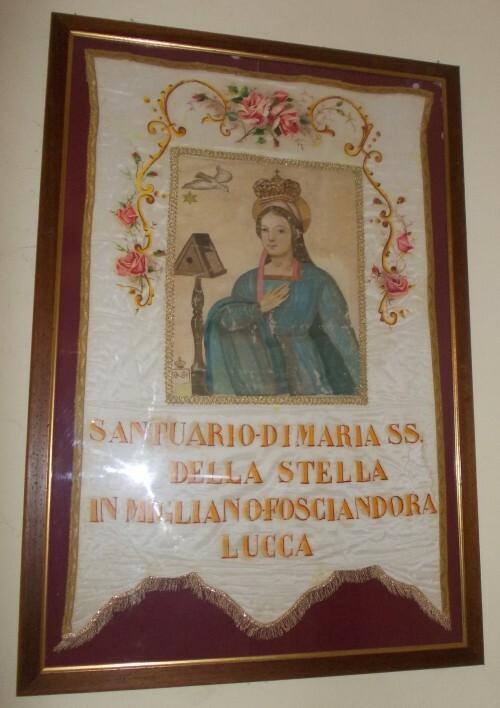 I have to thank her for her posthumous help to me in the nearby clinic of Saint Zita, when I had some medical problem, and which she helped to found. There may be other mysteries in just this one church of Sant’Agostino but they were not investigated as I felt that my lunchtime had arrived and, thus, I headed for the nearest trattoria. The biggest draw for pilgrims (or religious world travellers) in Padua is the sanctuary of Saint Anthony where his mortal remains are kept. Simply called “il Santo” by Paduans, I expected the sanctuary to be yet another monument to mass pilgrimages with all the often-kitsch paraphernalia associated with these places. I was pleasantly surprised. St Anthony’s basilica is an extraordinary piece of architecture uniting byzantine domes, Romanesque arches and gothic heights in a unique amalgam reflecting the internationalism of a mediaeval world-trading Venetian republic. Within its vast spaces, pilgrims and sight-seers alike mingle in a convivial mass which appears to be well-organised. 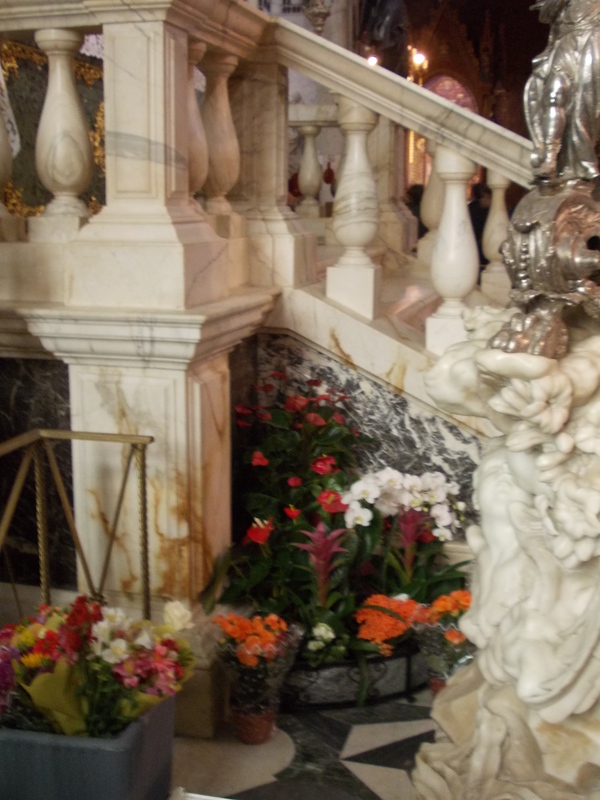 As my wife’s real first name is the female version of the Saint’s name we headed to the ornate chapel of his relics housed behind a side altar and automatically placed our hands on the rough rock surface warmed by so many other hands. We then walked to the reliquary chapel crowning the main apse. Here I was somewhat taken back by the uncorrupted tongue of Saint Anthony, removed from his body at his death, and by the equally uncorrupted vocal apparatus of the preacher saint, placed in a new reliquary when the tomb was opened in 1982. 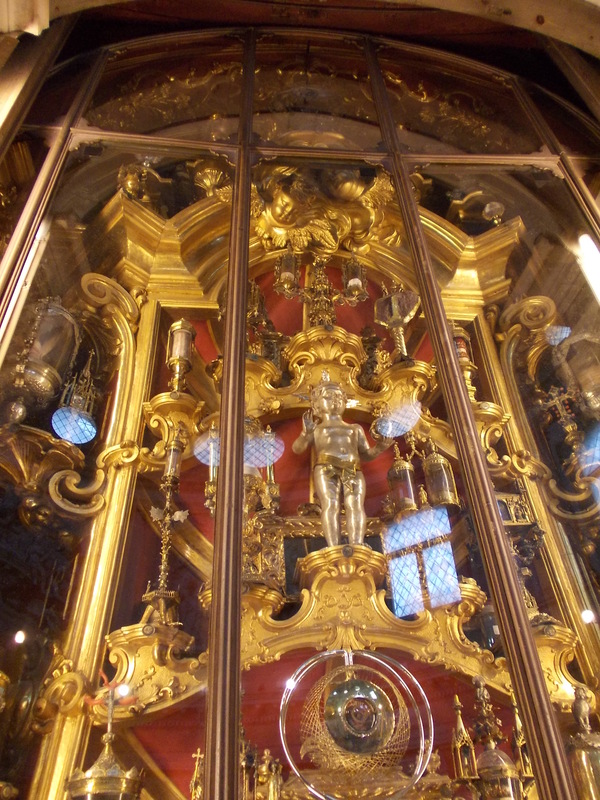 Indeed, at pre-defined intervals, the whole of the saint’s remains are placed on view, although when we visited he was safely tucked away behind the altar. I’m not sure of the wisdom of showing off a saint’s vocal apparatus – perhaps it is a metaphor to reinforce the conviction that the words he preached were ordained by God. Certainly, St Anthony’s sermons remain highly relevant teachings and are easily available on the Internet. He is, after all, one of the thirty-three doctors of the church in the same way that Catherine of Siena and Francis of Sales are doctors (and Francis of Assisi is not). If you weren’t sure how one qualifies to be a doctor of the church then this title is only given to those whose writings and preachings are useful to Christians “in any age of the Church.”. i.e. of international appeal. It’s extraordinary that someone born in Portugal, and who started his career soldiering, should have become so thoroughly part of Italian life: indeed, more than that, become a major saint in Roman Catholic culture, for there is no doubt that St Anthony, patron saint of lost causes, things and persons, a Franciscan, is the closest in popularity to Saint Francis of Assisi..
St Anthony is particularly invoked when one has lost things. Since I’m beginning to forget more and more where such items as my garden dibber or my cell-phone charger have been mislaid in our domestic confusion I’m quite convinced that I may be calling on this amiable and learned saint more often in future. More seriously, St Anthony is the patron saint of missing people. In common with TV channels in other parts of the world, there is an often harrowing missing persons’ investigative programme on RAI called “Chi l’ha visto?” (Who has seen him (or her?)?) Many people whose loved ones have suddenly disappeared into the blue appeal to Saint Anthony in their search. The reason St. Anthony’s help is invoked for finding lost, stolen or abducted items or persons is because of the following incident: Anthony had a book of psalms with his own notes written in it for teaching purposes. A novice decided to abandon the course and stole the book when he left the friary. St Anthony found the book missing and prayed for its return. The thief got the message and returned not only the book but also returned back into the order. After examining the saint’s relics we found ourselves in a chapel of the blessings, beautifully frescoed by that greatest of recent Italian painters, Pietro Annigoni, who carried out some of his most magnificent works for the Saint (quite apart from painting the Queen of Great Britain). Here we were privileged to receive a personal blessing from an Antonine friar, which made us feel very happy. We wanted to explore more of this often neglected city of Padua, in particular the Palladian town hall and the historic caffé Pedrocchi, but suddenly the whole marvellous edifice was literally shaken by one of the loudest thunderclaps I have ever heard which was followed by a veritable deluge. 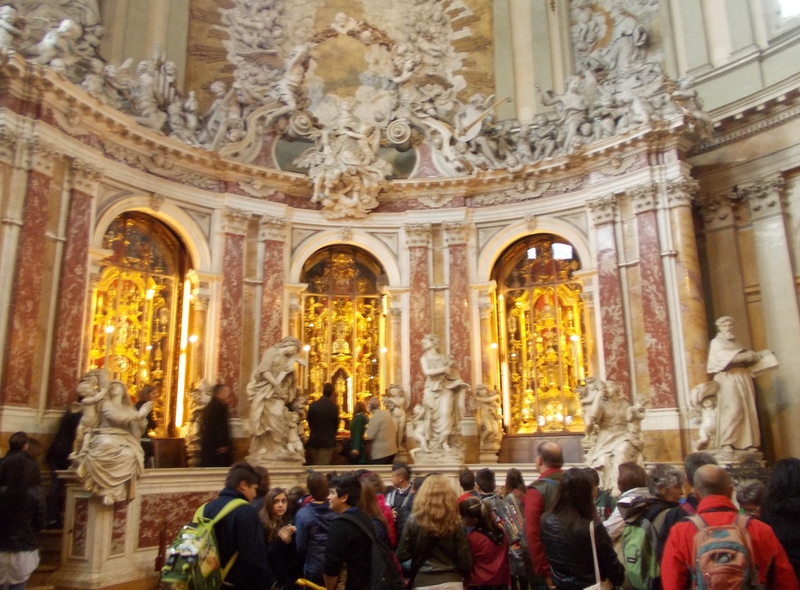 We, therefore, took the chance of continuing to shelter in the basilica and visited some of its most beautiful features, including three cloisters and centre of liturgical activity. We attended an audio-visual show which taught us more about this remarkable person and the current work done by the St Anthony friars. The audio-visual show must have dated back twenty years and I felt its quaintness should be preserved. Incidentally, St Anthony’s basilica has a glorious musical history. For example, Giuseppe Tartini, the great violinist and author of the “Devil’s Trill”, was music director here and the prodigious renaissance composers Costanzo Porta and Barbara Strozzi are buried here. 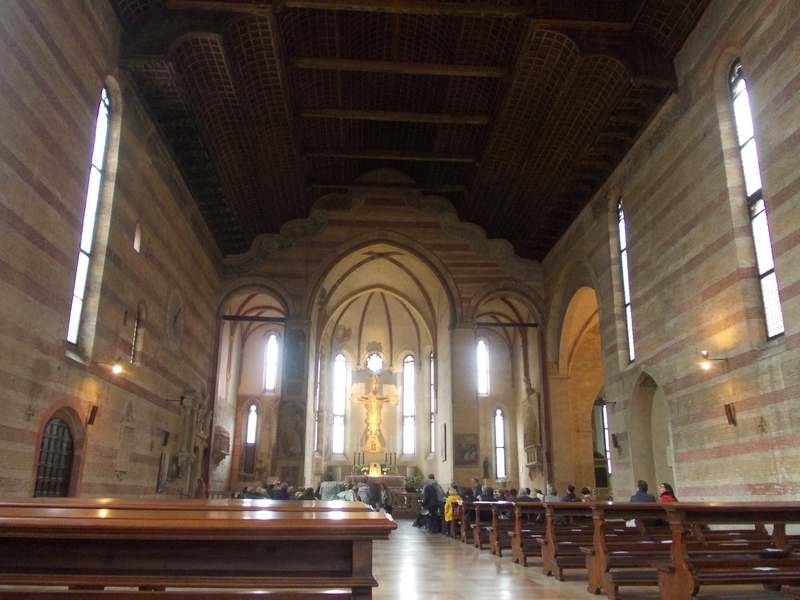 We stayed long enough in the fabulous basilica for the storm to die down a little before making our way to the Scrovegni chapel area described in our previous posts. I would have added a fifth “must-see” set of frescoes in Italy on my list in my last post but on Saturday 11th of March 1944 at 11.45 AM, during the fourth allied bombing raid on Padua, Mantegna’s fresco cycle dedicated to saints James and Christopher in the Ovetari chapel in the Eremitani church, just next to Giotto’s Scrovegni chapel, was irreparably destroyed. Why here? Perhaps because just north of the church is Padua’s main railway station. I wonder if that building was greatly put out of action by the Anglo-American imprecision bombing. 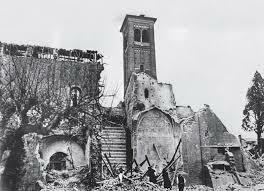 Actually, it seems that the Allies wanted to hit the German command at Arcella, but the wind and a very approximate tracking system caused ​​the bomb to fall on the Ovetari chapel instead, destroying the frescoes. This raid was thus not just a humanitarian disaster, with hundreds of casualties, but also an artistic one. 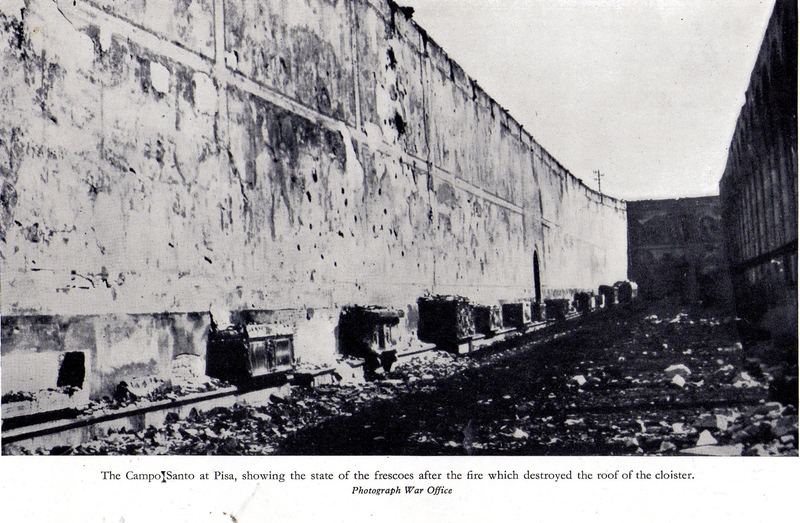 One hundred and eleven “flying fortresses” dropped more than three hundred tons of bombs over Padua. Mantegna’s frescoes were not the only victims. Other frescoes by notable Venetian painters like Vivarini were also destroyed, and many of the city’s buildings and areas were demolished including the civil hospital, Altichiero, Ponte di Brenta, Vigonza, Noventa and Arcella among other centres. The restoration of the Ovetari chapel began immediately, with the recovery of fragments of the Mantegna’s frescoes. Too many pieces, however, were never found. Like a giant jigsaw puzzle, people have tried to rebuild that masterpiece with the latest restoration techniques, most recently in 2006 when computer technology was used to piece together fragments from one hundred and thirteen cases housing the remains. Much was never able to be reconstituted but in 2011 someone left on the altar of the Eremitani church a box with four missing pieces from Mantegna’s fresco cycle. I’ve also discovered that immediately after the Eremitani disaster the Allied command set up a task force with the best American and British art experts to map all the artistic sites considered sensitive, and therefore to be protected. They were called the” Angels of Venus” and came to the Eremitani a few days after the bombing to safeguard the area. 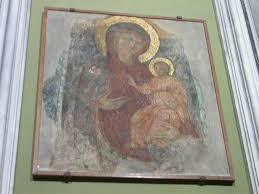 But it was too late: because of previous poor security, some vandals had already taken home the larger fresco fragments. So the appeal for further fragments to be returned goes on. Reasonably, there will be no penalties inflicted on those who return the precious remains. After the wonders of the Scrovegni chapel we visited the Eremitani church and sadly saw what’s left of the Mantegna frescoes, the fragments of which have now been pieced over a “virtual reality” image. At least I got some idea of what the cycle would have been like and why it is important in art history. Mantegna was bridging the gap between the post –medievalism of his master Vivarini and the renaissance-inspired example of his own art filled with extreme perspective points, tightly flowing robes, highly defined faces and fragments of ancient roman architecture. The chapel is also important because it contains early work by Mantegna done between 1448 and 1457, well before he began working for the Gonzaga in Mantua and painting the Triumphs of Caesar, his masterpiece, now at Hampton Court Palace in the UK. The terrible loss of the frescoes, commissioned by the notary Ovetari for his family chapel, in the history of western art was commemorated by an exhibition in the nearby fine arts museum housed in the Palazzo Zuckermann (11 April to 25 May). I didn’t know about this exhibition, which also extended into a bar where we bought a much needed cappuccino. The photographs (mainly black and white) of the chapel before 1944 were particularly poignant and, for me, gave a much better idea of the lost wonder of this early Mantegna work than any “virtual” reconstruction. There was also a model illustrating the terrible damage perpetrated by the bombing of the Eremitani church. 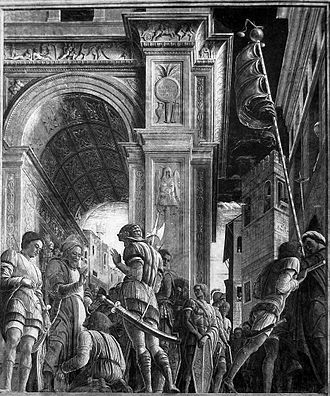 Planned downright ignorance – In 1488 Mantegna was called by Pope Innocent VIII to paint frescos in a Vatican chapel. This series of frescos, including a Baptism of Christ, was destroyed by Pius VI in 1780 because he didn’t like them! Neglect – a Gonzaga stately house near the church of San Sebastiano in Mantua was once adorned with many paintings by Mantegna. Although the house still stands, the pictures have perished through damp and negligence. What a miracle that the Scrovegni chapel, only a hundred yards away, did not suffer the same fate! Was the hand of God somewhere here I wonder?